GEORGETOWN, Ky. (June 28, 2017) — Kentucky brewers, Kentucky Proud producers, and Kentucky State University (KSU) will produce craft beers infused with locally grown ingredients that will be released this fall. 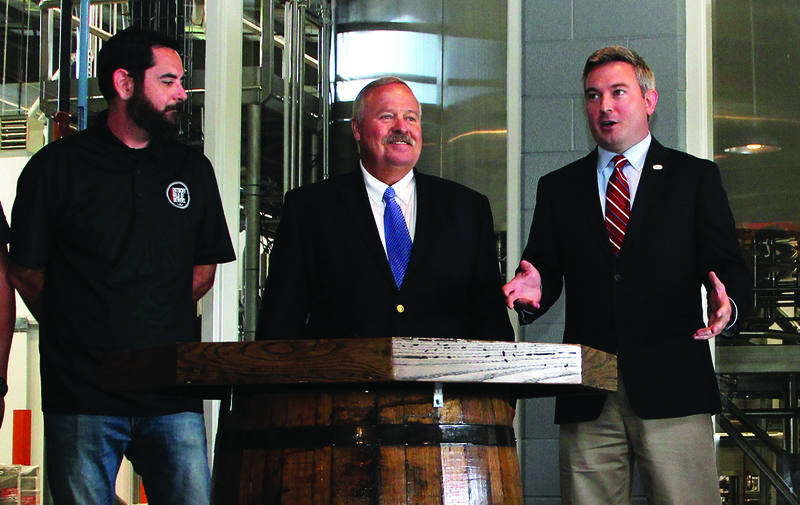 In a news conference today in Georgetown, Agriculture Commissioner Ryan Quarles joined representatives of the Kentucky Guild of Brewers, the Kentucky Hop Growers Alliance, and KSU to announce the project. The craft beers will be released Oct. 12-14 during Kentucky Proud Beer Week. “This venture will support small family farms and small businesses in new economic activity, as well as bring a unique Kentucky fruit, the pawpaw, and blackberry, the Kentucky state fruit, to consumers in new value-added products,” said Dr. Kirk Pomper, director of Land Grant Programs at Kentucky State University. Hops – Country Boy Brewing, Georgetown, and Monnik Beer Co., Louisville; Mile Wide Beer Co. and Falls City, both of Louisville. The pawpaws will be sourced from multiple Kentucky growers. The blackberries will come from KHI Foods in Burlington. The hops will be provided by members of the Kentucky Hop Growers Alliance. Kentucky State’s Fruit and Vegetable Mobile Processing Unit will be used to process the fruit into a form that the brewers can easily use in their craft beers. Processing will be completed at the KSU research farm near Frankfort. To find the dates and times when the craft beers will be released, watch the Kentucky Guild of Brewers website, kygbrewers.org.